Hannah Barber is the Elvira Growdon Intern for Collections and Archives Management for summer 2018. Hannah is a current student at Syracuse University’s School of Visual and Performing Arts pursuing her Masters in Museum Studies. Hannah’s passion for museums and collections stem from her belief that museums can provide education that is inclusive and accessible for everyone and that collections are educational resources available to all. Figure 1: Boston Children’s Museum’s raggiera. What is this object supposed to represent? Some may look at it and see the shape of peacock plumage or a medieval handheld fan of some sort. This object is actually a woman’s headdress. With several different names including raggiera, sperada, guazza, and corona lombarda that translate to “rays” or “Lombardian crown” in Italian dialects, they are typical of the Lombardy and Piedmont regions of northern Italy as well as the southernmost region of Ticino in Switzerland. 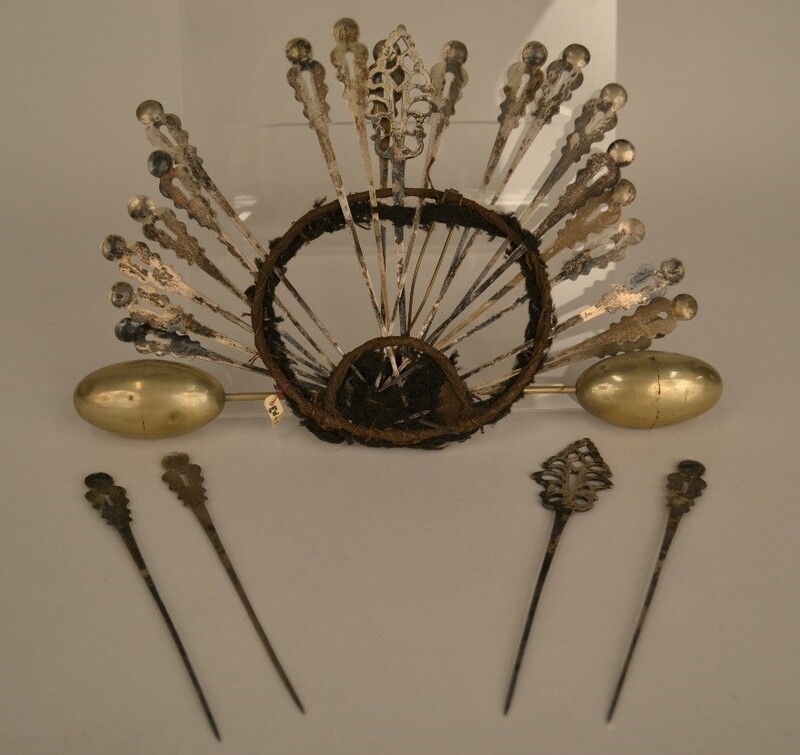 The headdress is comprised of thinly pounded silver pins with pointed ends, a circular metal frame with braided thread wound over the frame, and a long pin with egg-shaped heads at each end to help support the frame at the nape of the neck. This traditional headdress dates back to the 16th century in these regions. 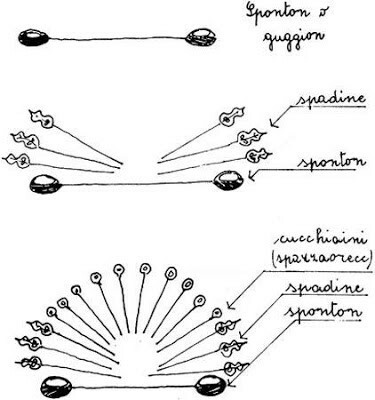 Figure 2: A diagram of the different components of the headdress with their Italian names. Courtesy of Roman Kozakand’s blog. This headdress has a deep-seeded history in Italian/Swiss tradition. For most women, it was worn for the first time on their wedding day. The fiancé would give the bride-to-be a headdress before their wedding, as a dowry gift, and which would include about 15 silver pins. The mother-in-law or other female relatives would help place some of the pins in the bride’s hair days before the ceremony and each day leading up to the ceremony, the bride would add more pins. After the ceremony and celebration the husband would continue gifting pins to his wife throughout their marriage. This was considered a sign of affection and prosperity within the relationship. Today, the traditional dress is less common for weddings but remains seen as a costume in traditional dance groups as a way to preserve their history and culture. Here is an example of a dance group in traditional dress. 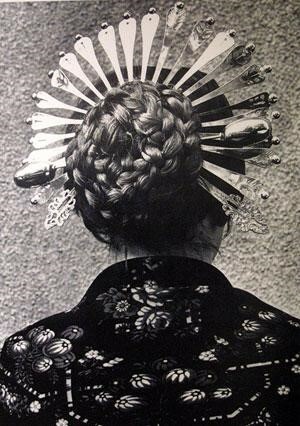 Figure 3: A photograph of the raggiera on a woman’s head. Courtesy of Roman Kozakand’s blog. In Boston Children’s Museum’s collection, this raggiera is labeled in the collection as a “Brittany Headdress”. Brittany, a northwestern region of France, does not appear to have this type of headdress in their cultural ceremonies, so it was a challenge for me to discover where this headdress originated from after reading through the records. We do not know the story of how this beautiful headdress became part of Boston Children’s Museum Collection, beyond a name and donation date. We care for it, like all the objects in our collection, so they can become educational resources for everyone. This is one reason that I enjoy collections so much! The endless discoveries that can be uncovered through research is fascinating and I learn something new almost every day I get to work with collections. See what else you can discover in BCM collections! “Raggiera.” Gruppo Folkloristico Bosino. http://www.folkbosino.org/raggiera.html.